Culms: Erect, stout, strongly triangular, concealed in persistent bases of old leaves. Leaves: Blades 4-7, flat, thin, elongate, pale green, less than 1/8 inch wide, glabrous; margins rough. Sheaths: Tight, inner surface whitish transparent, outer surface green and white spotted. Inflorescences: Spikes, bisexual, 2-5, sessile, closely clustered, 1/4 to 1/2 inch long, nearly spherical; pistillate flowers above staminate flowers; bracts mostly scale-like; pistillate scales lanceolate, barely reaching bases of perigynia beaks; margins light brown; centers green; tips blunt or pointed; perigynia 15-30 per spike, broadly ovate, firm, flattened, green, outer face faintly nerved, inner face finely nerved; beaks less than 1/3 length of body, 2-toothed. Fruits: Achenes, lens-shaped, yellowish brown, 1-seeded; stigmas 2, short, reddish brown. Habitat: Dry or moist upland prairies, bottom ground, open thickets or woodlands, shorelines, and ditches. Comments: As inferred by its name, pest sedge can be somewhat weedy. 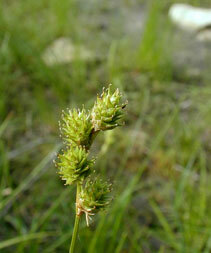 Carex molesta closely resembles Carex brevoir. The 2 species occasionally intergrade.